All Ornamental Ponds will need to be cleaned at some point due to a build-up of organic debris from decaying leaves, fish waste and other environmental factors. 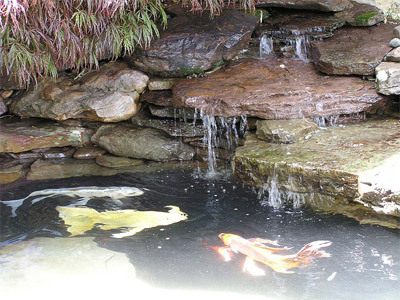 We can help determine when and how often your pond needs to be cleaned by evaluating a variety of factors such as fish population, pond size, pond setting, and existing filtration. Spring pond cleaning is a great way to start the pond season. The pond cleaning is also a perfect time for plant repotting, plant and fish deliveries and over all pond assessment. Pond cleaning services include draining pond, removal of all fish, critters and plants, trim & fertilize plants, remove algae, muck and debris from pond, streams and waterfalls, clean filters, pumps and plumbing, refill pond, condition/dechlorinate water and safely return fish and plants. During the pond cleaning we will hold your fish and critters in a safe tank with aeration and stress coat. Spring pond cleaning will help keep your pumps and system flowing smoothly, and will help lower your maintenance throughout the season.